Recently while shopping at Carrefour, a mega all-purpose super-store, I spotted a new wine called, “ATempranillo”. Then again, maybe it was called, Anta Banderas Tintor Roble 4 meses? Not entirely clear. 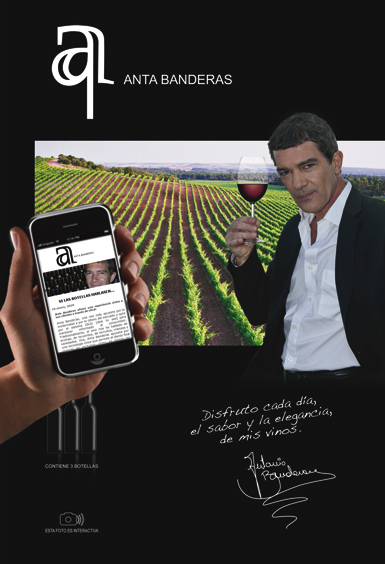 Regardless, what caught my eye was not that it was produced by Antonio Banderas‘ new Ribera del Duero winery – though odd – but that the neck label on a Spanish wine allowed you to read it with your phone! WOW! It’s only been a few years since we started pushing a technology called QRcodes with the help of Adegga.com – but hey, better late than never – and I was excited to see it on a “celebrity wine” in hopes that it would raise its exposure. Unfortunately, not 2 seconds later did I notice that it lacked a QRcode, or any other Datamatrix code, to actually read the label with your smart-phone. Upon further inspection, I also realized that the label required that I download a special software called a CLIC2C code, forcing me to clutter up my phone with yet another piece of worthless software that I’ll use once in my life. Ah, but it gets worse. Upon downloading the software, and testing it on the label, it still didn’t work. So, I ended up entering the code manually and was promptly redirected to their website – a pointless task when they could have simply listed the website on label. Now I won’t go into depth regarding my experience of the website, but suffice to say, it didn’t work, and involved a long movie of grape vines and modern architecture that left me with a bad taste in my mouth. Not to mention the fact that the information about the wine itself was so convoluted and confusing that I was left scratching my head wondering what was packed into the bottle. The point I want to make is simply this: STOP TRYING TO RECREATE THE WHEEL. You know why each country has one type of power outlet that they use for appliances and other electronics? It’s so that people don’t need to rewire their house each time they buy a new toaster or television. The power outlet stays the same, but what is attached to that cord is different. Same thing with your wine label. DataMatrix images are becoming a standard open way for people to share information. Apps like BeetagReader work on almost all mobile devices. Your need to be different is really just a great way to put up a road block to your customers. QRcodes work well, and are being adopted all over the place. So please do a bit of research before you try and be innovative with your wine label. Remember, your wine label is “the appliance”, and its information needs a standard plug. Please give us one. And the greatest lesson of all, first learn to make a quality wine. Your first effort with ATempranillo (if that is the name) really needs some work. Update: After revisting the site, which I needed to google as there is not mention of it on the label, I found a new look http://www.antabodegas.com/ though I can’t find the wine that had the code on it listed as a wine from their winery. I tried to find a way to enter the code from the bottle and all I found were sites saying that “the product does not exist”. So I wonder if the site I saw before was a test, though a very large one considering the stacks of wine I saw at Carrefour asking you to use this “new technology”. I guess better luck next time.